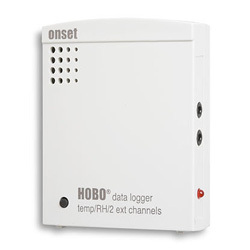 The HOBO U12 is a 4 channel data logger with two internal sensors for measuring temperature and RH together with two external channels. The external channels accept a wide range of external sensors, including temperature, AC current, AC voltage, CO2, 4-20mA, and DC voltage cables. Programmable and push button start. Voltage Input Cable for Hobo U12 and ZW Series Loggers. Handles up to 2.5V dc input. 0 to 10Vdc Voltage Input Adapter Cable for Hobo U12 and ZW series loggers. 0 to 24Vdc Voltage Input Adapter Cable for Hobo U12 and ZW series loggers. 0 to 5Vdc Voltage Input Adapter Cable for Hobo U12 and ZW series loggers. 0-20A Split-core AC Current Sensor for use with U12 & ZW series Loggers with external channels. 0-50A Split-core AC Current Sensor for use with U12 & ZW series Loggers with external channels. 0-100A Split-core AC Current Sensor for use with U12 & ZW series Loggers with external channels. 0-200A Split-core AC Current Sensor for use with U12 & ZW series Loggers with external channels. 0-600A Split-core AC Current Sensor for use with U12 & ZW series Loggers with external channels. Pack of 5 CR-2032 lithium batteries. Note: Lithium batteries cannot be shipped on commercial airlines, and more than 24 cannot be shipped in a single box. Temperature Probe for U-series Data Loggers. Stainless-steel food-grade tip with 1.8m cable. temperature range is -40° to 100°C in air or water. Temperature Sensor for use with U12 series data loggers. For measuring temperature in air, water or soil, the sensor comes with 1.8 m of cable. Temperature Probe for U12 series of loggers with 1.8m cable. Plated copper probe for mounting to a pipe or flat surface.